British Columbia’s Highway 20 is the one on the map in grey that’s described in the atlas as Other paved road; Unpaved Road. Bring it on is what I say. Those are the roads where the traffic is almost nonexistent and the communities along the way are delighted to see a tourist. And where the only thing you have to stop for on the road is a horse or a cow – never a stop light. Here are 20 things you can do and see along Highway 20 starting in Williams Lake. What else would you suggest doing along Highway 20? Highway 20 takes you from Williams Lake in the South Cariboo over the Chilcotin Plateau to Bella Coola on the coast of British Columbia. Along the way there is only a smattering of small communities but plenty of places worth stopping. Check out the Fraser River – by car or via Jetboat. The river starts at Mount Robson and 860 miles later empties into the Strait of Georgia. Take a short detour and visit Junction Sheep Range Provincial Park – and in particular Farwell Canyon. There’s a hiking trail that leads to the top of the hoodoos and if you’re lucky you might spot a herd of Big Horn Sheep. Raft the Chilcotin River as it races through Farwell Canyon. Go fishing for rainbow trout in one of the lakes that dot the Chilcotin Plateau – Eagle Lake, Puntzi Lake and Tatlayoko Lake as examples. Go grizzly bear watching during the salmon run. You can do this around Chilko Lake, out of Bella Coola or by drifting in a boat along the Atnarko River. And the start of the season is just days away. Hike into the Rainbow Range in Tweedsmuir Provincial Park. The 16 kilometre hike was one of my best one day hikes EVER. Take a pack horse trip into the Rainbow or Chilcotin Mountains. Stop for a piece of pie and a look at the murals on the walls and ceiling at Lee’s Corner in Hanceville. Stop in Anahim Lake and arrange a floatplane tour over Hunlen Falls. Better yet, plan a multi day canoe trip on the Turner Lake circuit. You can hike in off of Highway 20 though that’s a slog or you can get dropped off and rent canoes on Turner Lake. Pay your respects at the Native Cemetery on the south side of the highway near Redstone. Head for Charlotte Lake, just 20 kilometres off the highway and relax for a few days at the Atnarko Retreat. Read, bird-watch, fish, kayak and swim or do nothing at all. Drive Highway 20 all the way down to Bella Coola. That would include the eleven kilometers of steep, winding, dirt road with serious drop offs. Walk the Eagle’s Nest Marsh Trail on the southwest side of Anahim Lake. Look out for the bald eagles, white pelicans, trumpeter swans, ospreys and great grey and horned owls. Head to Nimpo Lake, a major float plane center, to arrange a fishing trip to remote areas like the Dean and Blackwater Rivers. In Bella Coola area choose from a variety of hikes including Schoolhouse Mountain Falls, Snootli Creek Regional Park and the trails to Blue Jay Lake and McGurr Lake in the high alpine. Drive the streets of Bella Coola and admire the native art – totems on front lawns and murals on the grocery store. Head to Clayton Falls Park just past the ferry terminal in Bella Coola. Take a picnic lunch and watch the world go by. And take a few minutes to check out Clayton Falls too. Look for the petroglyphs at Thorsen Creek in Bella Coola. Hundreds have fallen from a cliff face and lie strewn in the forest. The site is estimated to be 3,500 years old. You can arrange for a tour with Nuxalk guides. Wow, Rainbow Range and Junction Sheep Range are awe-inspiring! Such gorgeous photos that really make me want to explore places I’d never even considered! @Jeannie They are both areas few people have heard of – and yet I agree they’re positively gorgeous. I hope you make it there one day. We’ll difinitely be referring to this series of posts — this one in particular — before we head north again. Thanks for great tips and photo inspirations. @Jackie Please feel free to email me if you have specific questions. That ‘other/unpaved road’ looks great to me. Man, the views alone are worth the trip! How spectacular, Leigh. That Native Cemetery looks very compact. @Marcia I wouldn’t have even noticed the cemetery is I hadn’t been looking for it. It was mostly overgrown but very interesting to wonder through. Outstanding post, Leigh. The great diversity of photographic subject is testament to the nature of Canada’s natural wonders in the west. Soon I will spend a few days exploring the east. Thanks for sharing this post. I thoroughly enjoyed the photographs and look forward to visiting these attractions. @Barry There’s so much great territory in central BC but so few people have journeyed there. I hope this post inspires people to go. You’ve inspired us, Leigh! Next August when the Bitterroot Valley fills with smoke, we’re thinking about escaping on a road trip to explore Highway 20 from Williams Lake to Bella Coola. @Donna You will thoroughly enjoy this trip. Email me for even more ideas of what to do and where to stay. I want to spend at least a week on this highway…. in the season that’ll enable me to watch the bears :) I don’t suppose there’s a way of exploring it with public transportation? @Ayelet – I think the population is too small to make public transit a reality – though I’m sure you could pay individuals to get you around. Outstanding post with stunning photos, Leigh and I’ll refer to it on the blog again if you don’t mind. (http://www.resortsbc.com/Wilderness-Adventures.html) It’s wonderful of you to write about our area. You do an awesome job! Just to let Ayelet know, there is no public transportation in our area, however, many of the accommodations operators including myself are often delighted to take visitors around to different attractions in their area. Every August long weekend, Nemiah Valley has its annual rodeo and mountain race, the trip out to Nemiah is beautiful, takes about 2 1/2 to 3 hours from Williams Lake … about an hour on hwy 20 then left at Hanceville onto the Taseko Lake Road. Nemiah also has an annual horse and wagon trip from Nemiah Valley to Williams Lake for the Annual Williams Lake Stampede, that in itself is a 8 day trip on horse and wagon. We have been at the Woodland Caribou Resort on Puntzi Lake. We went last year in June and this year we have been 4 times! Wonderful, afordable spot and central to travel for day trips along Hwy 20. @Maple Ridge Mom – Thanks so much for your input. Good to know. @Geoff Looks like a great addition to Highway 20. Thank you for that info. @Gailene Thank you for all those FANTASTIC suggestions. I spent about a week in the area and would love to spend even more time exploring. There is so much more than meets the eye. Stunning photography. Thank you so much for the photos. I now realize why my nursing buddy, Barb from AB just loves the caribou and the Bella Coola area. @Alana I think it’s an area that’s very easy to fall in love with. Lovely pictures and the Chilcotin is truely a beautiful place. BUT – FYI – there are NO PUBLIC TRAILS OR PUBLIC BIKE TRAILS on the Hwy 20 side of the Chilcotin River at Farwell Canyon. It is private property! The Dunes are Private Property. The Kiosk is also on private property. It was put there (by the Ministry of Environment with permission) for the purpose of information regarding the surrounding area and the Junction Sheep Range.. The road through to the Junction Sheep Range is gazetted, but it goes through private property. The Junction Sheep Range is well off the main road and is mostly for a vehicle with high clearance. You can cross the Chilcotin River brige and view the Dunes from the viewing site just above the Bridge. @Jim Plenty to do in a rather unknown part of the world. Wonderful scenery, beautifully shown here. Would love to see it all for myself one day. @Andrew It’s a part of the world most Canadians never visit yet it’s so very beautiful. 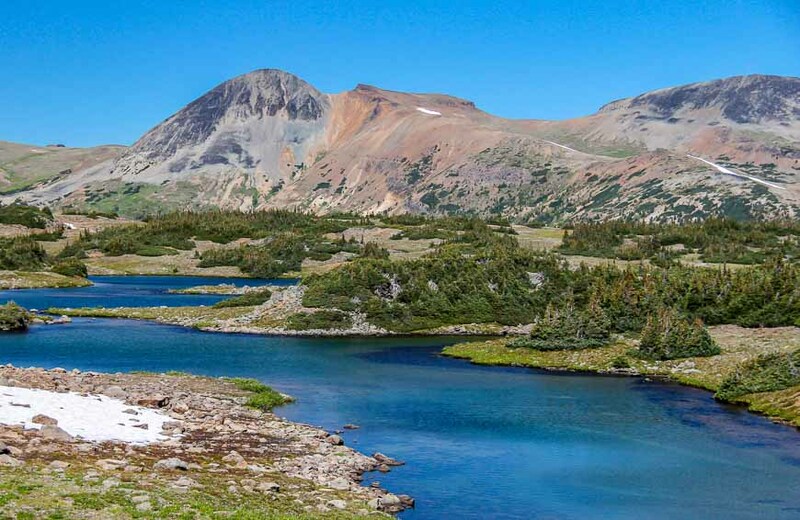 Pioneer Trail above Bluff Lake out of Tatla Lake offers a spectacular 40 minute circle hike with views of coast mountains and ends with a walk along the lake which is great for a swim or fish. Can you get in to lonesome lake by car? @Stan I don’t know but I would recommend contacting the Chilcotin Tourism Association for an answer. @AuntieO Thanks for that info. No, You cannot drive a car to Lonesome Lake. I drove as far as I could about 26 years ago and was still a long hike from Lonesome Lake. Looked down upon it twice. Once from a float plane and the second time from atop Trumpeter Mt.